Final version for the latest of "HD1.0 for XCL2.1" has just been released. RC version for the latest of "HD1.0 for XCL2.1" has just been released. After this version is tested for 1-2 week(s), HD1.0.2 final will be released. XOOPS Cube Legacy 2.1.5 released! XOOPS Cube Legacy (Package_Legacy) 2.1.5 is available. Thanks all contributors who tried to test with RC1, RC2 and RC3 for a month. 2.1.5 is minor upgrade version from 2.1.4. This version fixes one important bug & some bug fixes, and contains some patches. The previous version 2.1.4 had a bug around parsing URL. This bug triggered troubles to some AJAX modules, some users applied a hot fix for the bug. But 2.1.5 contains the fix. Therefore, even if you applied a hot fix for the bug to 2.1.4, you may upgrade to 2.1.5 without special steps. This version tried to contain many fixes to become last maintenance release, so RC test schedule was very very long. By that, it seems that 2.1.5 is very stable. If you're using Package_Legacy 2.1.x, there are not reasons that you don't upgrade your site to 2.1.5. If you're using a distribution package of Package_Legacy, perhaps a new versions of those packages will be released, so you should wait their announcements. The project already recieved new reports and new patches for more enhancements. So the project will keep efforts on HEAD of the Package_Legacy module of CVS. Remove mainfile.php and /install directory from the package not to break your current environment. Next, upload files of the package to your server. Finally, do update modules indicating red icon in the module management of the control panel. You may close the site in the control panel to hide your upgrading. Remove mainfile.php and /install directory from the package not to break your current environment. Next, upload files of the package to your server. Finally, do update five modules --- legacy, user, legacyRender, stdCache, pm (if you use) in the module management of the control panel. You may close the site in the control panel to hide your upgrading. - Fix Bug #1939992 - Invalid xhtml templates in legacy module. - Fix Bug #1924223 - The request which includes URL cannot be processed. - Fix Bug #1971682 - Could not read PM from a removed user. - Fix Bug #1971718 - cookie path always becomes '/'. - Fix Bug #1987219 - Remove invalid files from the extra directory. - Fix Bug #1989801 - cleanup to notice reference variable in class/tree.php. - Fix Bug #1990481 - Invalid Regexp at User_AbstractUserEditForm class. - Fix Bug #1992732 - $xoopsConfig doesn't referer mXoopsConfig in some cases. - Fix Bug #2003440 - X_UACTLINK is missing used in some languages. - Fix Bug #2010090 - Missing Content-Type in MailHeader by #1729813. - Fix Bug #2011775 - When a user deletes his account, principal is not created. - Patch #1961603 - portuguese translations: bug fix and enhancements. - Patch #1992777 - xoopsmailerlocal.php for zh-tw. - Patch #2011199 - Czech message catalog for XCL. - Patch #2016023 - Package Legacy 215rc patch FR and PT typo. - (Exception Patch) Improve LostPassAction. Minor update version of "HD1.0 for XCL2.1" has just been released. This package contains XCL 2.1.4 while HD-1.0.0 contains XCL2.1.3. XOOPS Cube Legacy 2.1.4 released! XCL 2.1.4 is available. 2.1.4 is minor upgrade version from 2.1.3, fixed many bugs and implemented some small features. Thanks all contributors who joined to 2.1.4 RC testing! SourceForge.net: Package_Legacy 2.1.4 RC Release! 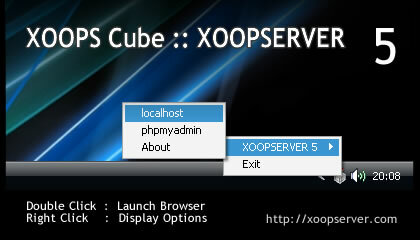 XOOPS Cube Legcy 2.1.4 RC has been released! XCL 2.1.4 RC is available for test. 2.1.4 is minor upgrade version from 2.1.3, fixed many bugs and implemented some small features. As you know, test is important for quality and needs man powers. Join to test 2.1.4 RC, please.